Joe is one of the most respected trumpet players around today. He is a graduate of the Eastman School of Music in Rochester, New York. After Eastman, Joe played lead trumpet with the Jazz Ambassadors of the U.S. Army Field Band in Washington, D.C. He then toured with Maynard Ferguson’s Band for the next five years. Joe was a member of the band when they recorded the hit song from the Academy Award winning movie, “Rocky.” He then settled in New York City and has been a fixture in the music scene there ever since, playing jazz, rock, and classical music for television, movies, and commercials. Joe is a veteran of over a dozen Broadway shows, most recently being Annie Get Your Gun and 42nd Street, and has played lead trumpet with every big band in N.Y. from Toshiko Akiyoshi and Louis Bellson to Bob Mintzer and the Thad Jones—Mel Lewis Orchestra. Joe has performed with Frank Sinatra, Ray Charles, B.B. King, Julie Andrews, Sammy Davis Jr., Johnny Mathis, Steve Lawrence and Eydie Gorme, Jerry Lewis, Wayne Newton, Vic Damone, Sarah Vaughn, Nancy Wilson, Ashford and Simpson, Chuck Mangione, The Temptations, The Four Tops, and Blood Sweat and Tears, among others. 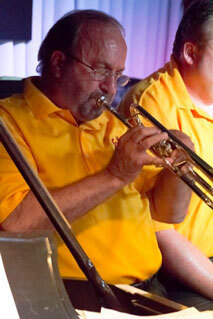 Joe lives in Marlboro, NJ and is active as a teacher, soloist, and clinician.